Sunshine Kelly | Beauty . Fashion . Lifestyle . Travel . Fitness: Batman v Superman: Dawn of Justice Who Will Win? The heat is on! The battle is up! Batman v Superman, Who Will Win? I’m rooting for BATMAN! No matter what you say, you can’t change my mind. Look here! for the first time ever in Malaysia, stand face-to-face with a life-sized statue display of Batman, Superman and Wonder Woman from the film. A life-sized replica display of the Batmobile from the film also makes its first appearance in Malaysia, which will you a chance to see up close why the iconic vehicle has earned its reputation as the apex predator on the mean streets of Gotham City. I want to ride in that Batmobile! This school holidays, Pavilion KL in partnership with Warner Bros. Consumer Products (WBCP), on behalf of DC Entertainment, present an epic universe of the World’s Greatest Super Heroes in the ultimate face-to-face between DC Comics Super Heroes Batman and Superman. For more DC Comics Super Heroes merchandise you can head up to their store at Pavilion KL on Level 5, Lot. 5.11.00. Or you can visit DC ComicsSuper Heroes Café at Sunway Putra Mall on Level 2, Unit 2-29. Have fun! Explore the technology and power of Gotham City and Metropolis from 10th March to 27th March 2016, which is a lead up to the release of Warner Bros. Pictures’ highly anticipated action-adventure film Batman v Superman: Dawn of Justice on 24th March 2016. Here are some of the fun activities for the fans of Batman and Superman - cosplay appearances and competition, arm wrestling matches and social media activities. Specially-curated collectibles produced by Prime 1 Studio (Japan) and Hot Toys (Hong Kong) are also on display alongside posters of the official movie trailer. Other activities include a Warner Bros. Consumer Products merchandise zone by the DC Comics Super Heroes store; an interactive photo booth and a game area with two games inspired by Batman v Superman: Dawn of Justice. Batman v Superman launch kicked off with the unveiling of the Batmobile replica by Ms Kung Suan Ai, Director of Marketing for Pavilion KL; Mr U Cheng Hock, Director of Group Retail Banking, RHB Bank and Mr Darius Tang, Creative Director, Warner Bros. Consumer Products (Greater China, India and South East Asia). You can participate in the #WhoWillWin on social media and help your super hero win by taking a selfie with his life-sized statue display at the Centre Court. Batman v Superman, Who Will Win? Post it onto Instagram with #WhoWillWin and #BatmanPavilionKL or #SupermanPavilionKL (depending on the side you choose), tagging @PavilionKualaLumpur on Instagram. Stand to win exclusive merchandises. Visit www.pavilion-kl.com for more information. My children love both the super heroes too. Will bring them to Pavilion to check this out. Can't wait to watch the movie... and wow... I really have to head over to Pavilion to see all these amazing stuff!!!! Why Penang does not have this kind event? All the models are so real and cool, especially the CAR. 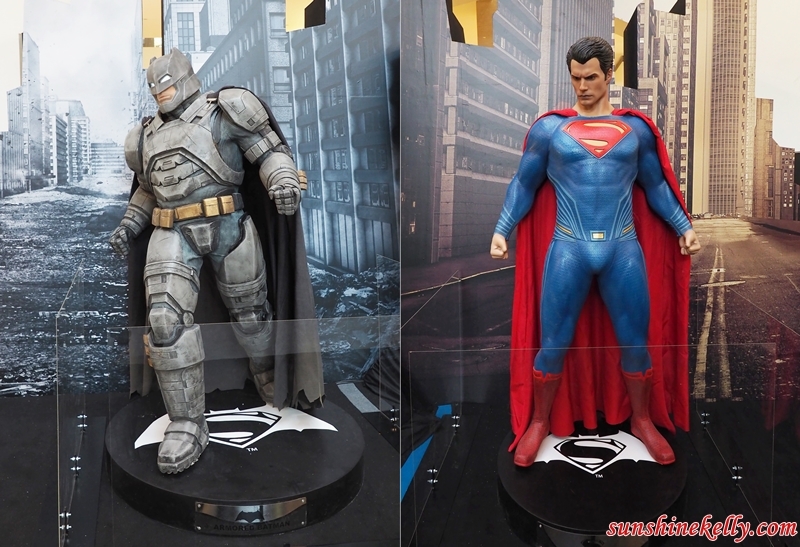 I love that batman and superman's patung. It's so cute!! We all love superheroes!! Looking forward to this movie. wow nice but ok...let me think. mmm....superman i guess..is the winner. Can't wait for the movie! I want to make one day and visit the Batmobile is so cooool!!! When I first heard of this movie, I was thinking how can Batman even compete with Superman. Batman is just a normal human behind a costume and he has his usual human related weaknesses. If anything, Superman should be more powerful. I am now eagerly waiting for this movie to come to Malaysian cinemas. Have been to this cafe before. But waited quite a long time cos too packed. We had a same event here and it was amazing to see the huge fan following. Love their stuff. oh cool, i just went there with the kids last week, love the bat mobile. BATMAN.. I wanna be just like him, all buffed up, yao yeng and good looking. sigh..